We have already discussed the merits of hard anodised cookware in the non stick cookware section of the website. Here we are presenting the range of hard anodised saucepan sets we have available. 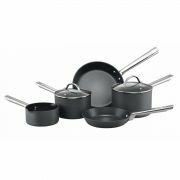 Saucepan sets take the chore out of choosing cookware individually and group a tried and tested range of cookware pieces into one handy to purchase box set and it is often better value than purchasing individual items separately.